The Hoegh #24 Ultra Deluxe Pet Casket is built for lasting durability and quality. All units are constructed of strong, high-impact styrene. The design and special sealant restrict seepage of water and the intrusion of air. Hoegh pet caskets are capable of serving as a Casket-Vault combination. 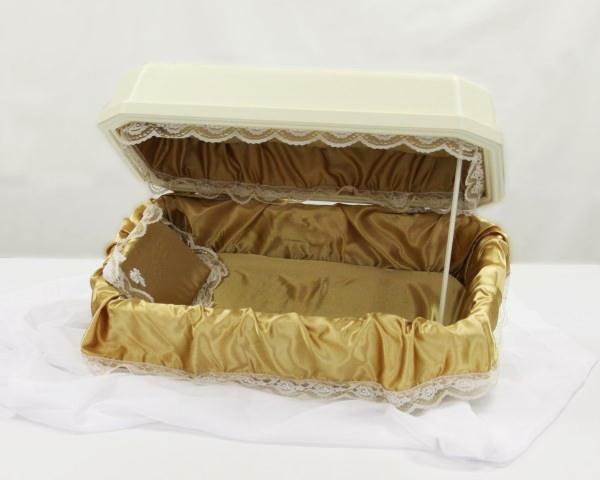 The Ultra Deluxe Style casket is only available in the 24" size and only in the Deluxe Style. The color of the exterior is almond. The interior is a soft brown satin, trimmed in white lace with a metallic gold band running through it. Material and lace are subject to change depending on availability. Deluxe Style caskets are richly fitted throughout with soft padding covered with crepe, skirted and trimmed amply with lace.